Four children separated by vast distances all undergo the same ritual, watched by cloaked strangers. Each child at the age of eleven drinks a nectar that determines whether or not the child will summon a spirit animal. The animals become connected to the child, and they can lend them strength when needed. The four main characters summon the Four Fallen, a wolf, falcon, panda, and leopard. These magical beasts have not been seen since the last great battle of the world. They signal the beginning of a new era of danger. Suddenly the paths of these children – and the world – have been changed forever. I thought that the differences in each spirit animal help establish very different points of view for each kid. I loved how each of the main characters was from a distinct culture and background. I genuinely like Mull’s writing and even though I am a big fan of his Fablehaven series I only picked this up because it was required for school. There is an online game associated with it and the assignment was to review the book and game and see if they work well together. I think that the book and game tie-in may get those reluctant readers to read. Over-all, outside of the game, I think Wild Born is an excellent middle-aged book and a good start to the series. I read other reviews where parents were concerned about the violence in the book and I can understand that. I read and have read books that are much more violent than this and so I thought Wild Born was tame. Also, and I don’t want to give anything away, but the death of one character was vital for another character to evolve. The violence and death in Wild Born has a point as opposed to just being violent. 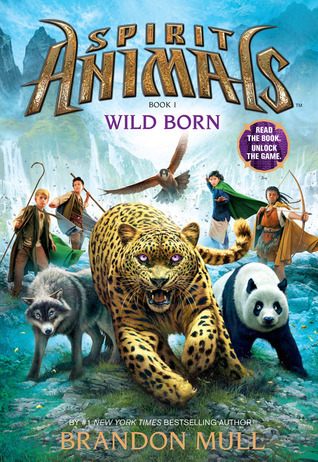 This entry was posted in Fantasy, Magic, Middle Grade and tagged Brandon Mull, Middle grade reader, reluctant reader, Spirit Animals, Wild Born. Bookmark the permalink.